At Tilden Dental Group, we provide smile changing, full mouth reconstruction treatments in the downtown Chicago neighborhood, Streeterville. For patients who are looking to revitalize their entire smile, we create a comprehensive treatment plan to meet their goals by utilizing the innovative techniques of implants, cosmetic, and restorative dentistry. Dr. Jordan and Zach Tilden are devoted to delivering beautiful smiles using only state-of-the-art materials. With full mouth reconstruction at our Chicago dental practice, patients can have a smile makeover composed by our experienced dentists. We begin with an in-depth consultation with you to clearly understand your goals and concerns about your oral health. When creating a treatment plan, we take into account older restorations that need to be replaced, teeth grinding, gum disease, and any untreated issues that have resulted in a less than healthy, beautiful smile. Once we’ve determined the issues and gone over recommended solutions, we take photos of your smile and create a virtual image as a mock-up of finalized treatment. As a gift to you, we create a cosmetic wax-up of the final results and you can leave with the beautiful temporary that replicates your future smile. Whether you have chipped teeth, ones that are deeply stained, or a crooked and crowded smile, we have cosmetic treatments that are combined to combat multiple aesthetic issues. Before any cosmetic dental treatments, we recommend whitening your smile through our in-office or take-home treatments. Straightening and Whitening Teeth – We provide Zoom!® in-office teeth whitening and Opalescence GO® for dentist-supervised, at home bleaching. For patients with bite issues and crooked, spaced out, or gapped teeth, Invisalign® indiscreetly straightens the smile with a series of custom clear aligners. As preferred providers, our Chicago Invisalign® dentists have the experience to treat complex bite problems for patients who weren’t able to receive orthodontic treatment or have relapsed. Full Smile Makeovers with Veneers are effective at treating issues such as deep staining, shaping the tooth, covers chips and gaps between teeth. 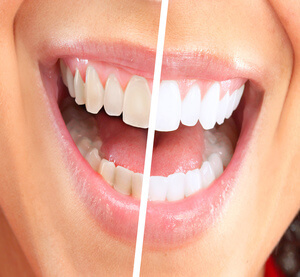 Made out of full porcelain, veneers can replicate the luminosity and glow of healthy, white teeth. Dr. Zach and Jordan Tilden will determine the extent of the damage of the teeth and recommend a combination of cosmetic treatments that will result in your full smile restoration. At Tilden Dental Group, we provide implant restorations for patients with advanced gum disease and those who are currently missing teeth and wearing dentures. Patients can receive Teeth-in-a-Day or All on 4, in collaboration with our specialists, depending on your needs. We create snap-in restorations as well as fixed bridges that allow you the convenience of stability and reliability. Dental implants and restorations effectively restore the health and youthful look to your smile. At Tilden Dental Group, our downtown Chicago dentists, Dr. Jordan and Zach Tilden, welcome all patients for full smile reconstruction at our Streeterville neighborhood dental practice. For more information about our comprehensive dental treatments or to schedule a consultation, contact Tilden Dental Group today!